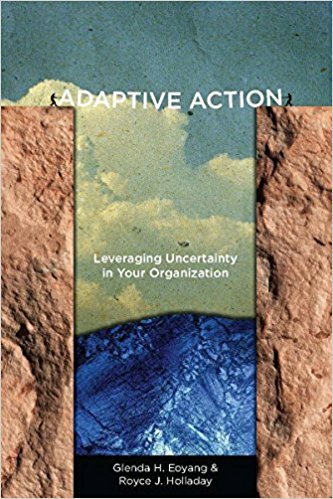 I highly recommend Adaptive Action: Leveraging Uncertainty In Your Organization. Its an academic look into adaptability but i like how they have laid out the ideas taking into consideration the spectrum of complexity, from the finite, structured, ordered, linear and technical to the infinite, ill-structured, disordered, non-linear and adaptive problems we face. I read it with my mind on how it would fit into policing and police training and policy decisions. Policing all too often looks at all solutions to problems as if the are a finite, structured, technical game, when in fact police crisis is very much an adaptive challenge that requires police officers solve problems by probing and thinking and using their wisdom, built on education training and experience instead of the all too often standardized approach of good and best practices and school solutions that seldom work effectively when things don't go according to plan. Adaptability is an effective change to an altered situation. Making that change, adapting comes from understanding complex adaptive systems and adaptive action. In this book the author keeps it simple by breaking our observations, Orientation decision and actions down into; What? So what? And Now what? She does so by illustrating through what she terms the CDE model (Container, Differences and Exchanges). Or patterns of behavior and the strategic game of interaction laid out academically but simple. If you want to change a complex pattern, you can do only one of three kinds of things. Change the exchanges by breaking existing ones, by altering them (making them stronger or weaker, wider or narrower, longer or shorter), or by adding new connections where none existed before. That is it. Those are your only options for influencing the emergent patterns in complex adaptive systems. In a finite game, it is easy to make sense. Everyone agrees on the goal; the rules are known; and the field of play has clear boundaries. Baseball, football, and bridge are examples of finite games. At one time in the not-so-distant past, we expected careers, marriages, parenthood, education, and citizenship to be finite games. When everyone agrees on the rules, and the consequences of our actions are undeniable, responsible people plan for what they want, take steps to achieve it, and enjoy the fruits of their labor. We know what it takes to make sense in a finite game. Most of us realize that we are playing a very different game. We are playing an infinite game in which the boundaries are unclear or nonexistent, the scorecard is hidden, and the goal is not to win but to keep the game in play. There are still rules, but the rules can change without notice. There are still plans and playbooks, but many games are going on at the same time, and the winning plans can seem contradictory. There are still partners and opponents, but it is hard to know who is who, and besides that, the “who is who” changes unexpectedly. In complex and unpredictable environments, important factors that shape the future are unknowable. Social, economic, climactic, and political changes erupt without warning. We can plan, but we expect our plans to go awry. We can work toward our goals, but we understand that our work may be in vain. We experience unintended consequences that too often punish what should be rewarded and reward what should be punished. This is a very interesting book on a topic ADAPTABILITY very near and dear to me.